EPP: A Shared Gift | OccasionalPiece--Quilt! Posted on February 21, 2012 by Elizabeth E.
Because I am a complete quilt dork, loving nearly all things quilting, I love looking at my very first completed English Paper Piecing (EPP) block. I love how I can use the fabric to make a secondary design. I love how I can sit and watch Downton Abbey or a movie or talk to my husband, and at the end I have another something to show for the time. I love how I learned it from Krista, and how she shared with me how to put it together, and how I went to other blogs and quilters and friends, enjoying the fruits of sharing from this community of quilters. I suppose my enjoyment is kind of all stitched together with the trip to the surgeon’s office today, and when he said, “Have a nice life. You’re all done,” I thanked him, hopped off the table, got dressed and zipped out the door, with only a bandaid (instead of a bulky gauzy dressing) on the healing wound site. I called my husband to tell him the news as I sat in the parking lot. I know I’m an easy-to-cry person so I wasn’t too surprised by the tears that followed, streaming down my face as I sat there in the warm sunshine, thinking about my little journey of the last two-plus months, and getting that advice from the doctor. So, I pass it on to you. Have a nice life. Finger some cloth. Sit in the warm sunshine for a few minutes. Enjoy those skills that you are developing, or have developed, in making something of yourself to leave behind if the have-a-nice-life line doesn’t materialize at the surgeon’s office, and you realize, like Sir Launfal, that all we ever have in this life is what we share. So, just today, I share my first EPP block with you on this very normal, this very poignant day. Thank you Elizabeth, I’ll pass it forward. lovely block and sentiment. do you know the name of it? Pingback: English Paper Piecing, continued | OccasionalPiece–Quilt! 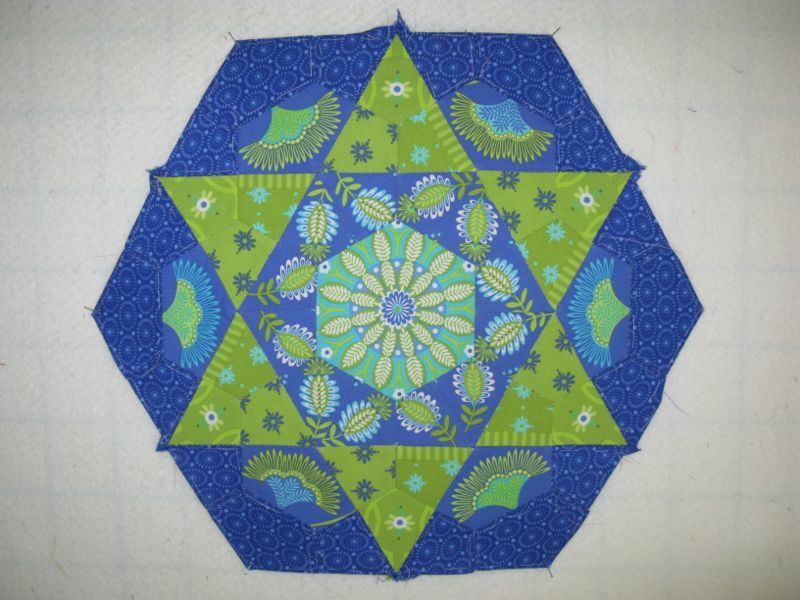 lovely EPP block! I too love how you are using the fabric design. thanks for your recent comment, you are a no-reply blogger, so I popped over to say hello. I’m adding your blog to my reader list, lovely work and intersting things here! Looks great! would you like to join an EPP bloghop?